Waterman has produced several filling mechanisms in addition to the lever-fillers and eyedroppers; for example, there was also the “coin filler.” The coin filler operates with a prop: Waterman provided a special “coin” to use with these pens. In the side of the barrel is an open rectangular shaped slot under which is a press bar. Once depressed by the special coin (or of course anything else the user might decide to use), the bladder was evacuated and the pen would fill. Waterman coin fillers are dated to 1913 and 1914. Waterman was trying to get around Sheaffer’s winning lever-filler patent. The coin-fillers weren’t produced for very long, resulting in their relative rarity. 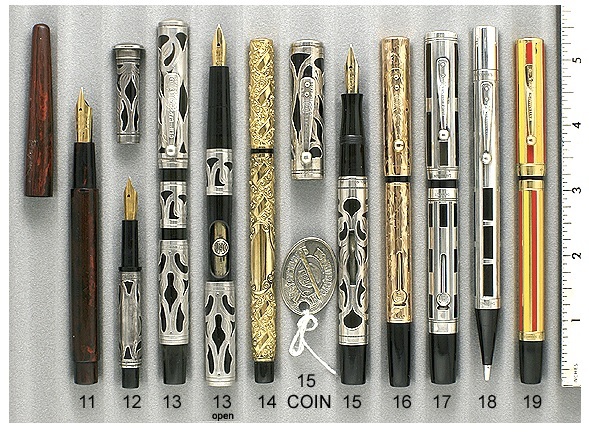 The 1913 coin-filler was the first pen introduced by Waterman which used a threaded cap rather than a slip cap. Slip caps tended to fall off in the pocket leaving quite a mess, so the threaded cap was a major improvement. In the following year (1914) Waterman provided threaded caps on their eyedropper-fill pens as well. Waterman produced the the pump-filler, sleeve-filler, and the coin-filler before the finally producing their long-lived lever-filler. And how did Waterman get around Sheaffer’s lever-fill patent — by mounting their lever in a “lever-box.” Ingenuity at its best! This entry was posted in Vintage Pens and tagged Coin-Filler, Fountain Pens, Go Pens, GoPens, Vintage Fountain Pen, Vintage Fountain Pens, Vintage Pen, Vintage Pens, Waterman. Bookmark the permalink. Follow any comments here with the RSS feed for this post. Post a comment or leave a trackback: Trackback URL. I have a Waterman’s coin for the 1913 coin filler pen. Could you please tell me what the value is? I HAVE A WATERMAN 0512 COIN FILLER WITH A 14K GOLD FILLED SLEEVE. HAS A CAP BUT IT IS NOT THE CORRECT CAP, NO FILIGREE ON IT. I HAVE NOT BEEN ABLE TO FIND ANY VALUES ON THIS PEN, WITHOUT THE CAP. I HAD A NEW SAC INSTALLED AND THE PEN IS IN VERY NICE WORKING CONDITION. ANY IDEA OF VALUE ?